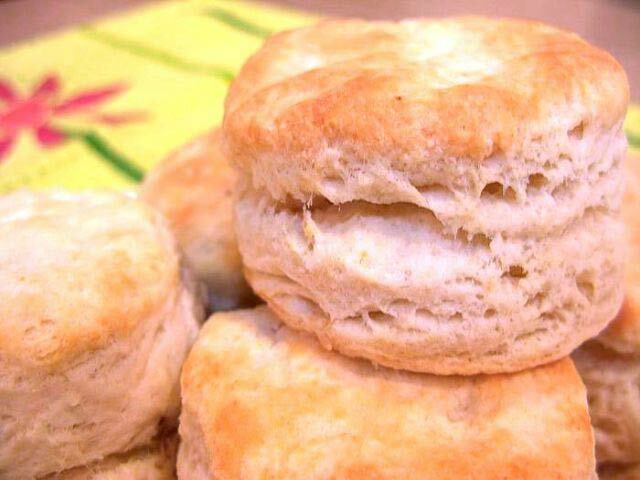 Biscuits are super easy to make, and don’t take much time either. Please, if you’ve never made biscuits from scratch, you owe it to yourself to give this a try. I promise these are better than any biscuit out of a can. First, measure out the flour into a mixing bowl. Then add the baking powder. Using a pastry blender, cut up the butter into the dry ingredients. If you don’t have a pastry blender, you can use a fork, or 2 butter knives. Keep cutting the butter until you don’t have any pieces bigger than a small pea. Next, pour in all the milk. Using a fork, stir the mixture until all of the dry ingredients are absorbed by the milk. Don’t overdue the stirring – when all the dry stuff is gone, you’re done. Next, sprinkle some flour out on your table or counter. Put the dough on the floured surface. Then knead the dough 5 or 6 times. To knead, fold it in half, press it down, and turn the dough a quarter turn. Then fold again, press down and turn. Do this 5 or 6 times. This is how the flaky layers are formed. When you’re done with the kneading, flatten the dough out with your hands into a uniform thickness of about ½ inch. Now for the fun part: using a biscuit cutter, or a drinking glass, cut the biscuits out of the dough. If your cutter is sticking to the dough, dip it in some flour in between each cutting. Carefully place the biscuits on a metal cookie sheet. Take the remaining dough, and form it into a ball, knead it a couple times, flatten it out, and cut more biscuits. Here’s how the biscuits look in the pan. OK, here’s a secret for getting biscuits to rise sky high, as opposed to flat hockey pucks. And here it is. Underneath all those refrigerator magnets, is the secret: the fridge. Put the pan in the fridge for 10 minutes, before you put it in the oven. Don’t know the technicalities of why this works, but it does. After 10 minutes, take the pan out of the fridge and put it in the oven. Bake for 12-14 minutes or until a beautiful golden brown. Remove the pan from the oven, and immediately remove the biscuits from the pan. Serve on a plate or serving bowl. Remember the sky high flakyness I promised? Well here it is. Cut them in half while still warm and slather with butter, jelly, apple butter, or anything that makes your taste buds happy. Once cooled, store remaining biscuits in a storage container to keep them from drying out. They can be re-warmed in your microwave in about 10 seconds.